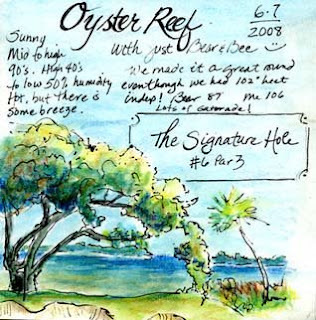 South Carolina LowCountry Nature Journaling and Art: Golf & Nature Journaling! 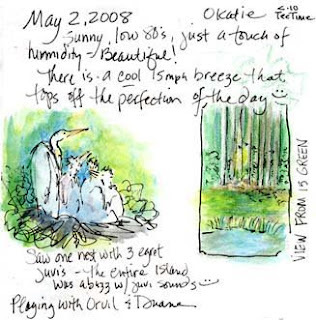 One doesn't have to stick to nature walks to gather journaling material! Keep in mind, journaling is therapeutic. 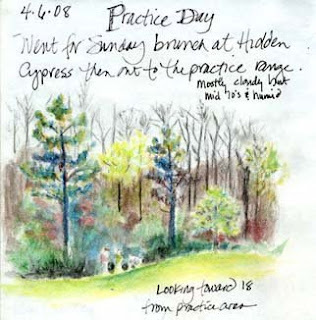 If you know you're going to be in a situation that can raise stress levels (for me, it's my golf game), bring along your journal! However, over the last 2 years, I've improved. I attribute it to three things. 1. I finally remembered to buy a small 5"x5" journal and keep it and a pencil case full of my journaling supplies in my golf bag, 2. Last year, my love purchased me a mini pair of folding binoculars that are also kept in my bag, and 3. This year, I finally found a driver I can hit (Ping - Lady Rhapsody).